You go out in the morning, start your engine, put the transmission in gear, give it a little gas, and you're off on your merry way. Sounds simple, doesn't it? But there's actually a lot going on to get the power from your car's engine down to the wheels to drive the car. And even more to make it seem that simple! The last piece of the puzzle to get power to the wheels is the axle. That's the part that connects the differential to the wheels, transmitting torque to turn the wheels and drive the car down the road. Once, not so long ago, those axles were fairly simple: just a solid piece of metal that rode on bearings. Sure, the bearings might need replacement after a while, but the axles themselves generally didn't need a lot of attention. Then came independent suspension and front wheel drive. All of a sudden the axle had to flex vertically to compensate for up-and-down movement while driving along the road, and horizontally to compensate for changes in direction. All while continuing to provide the torque to keep the wheels turning. That's when constant velocity joints, or CV-joints, came into play. And they require a lot more attention than the earlier style axles. That's okay, because your local Cottman center technicians are familiar with every type of axle on the road. They know how to recognize problems with them, and how to fix them when they aren't operating properly. And, maybe most important, they know when it's smarter simply to replace them instead of wasting money trying to fixing them. If you've been experiencing problems with whirring, grinding, or clicking noises from around the wheels — particularly if those noises only show up when you turn the steering! — give your local Cottman center a call. 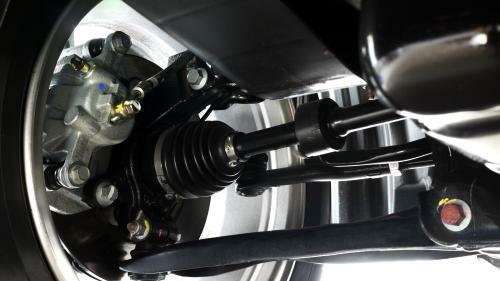 Let them know exactly what your car's doing, and they'll check for any problems with the axles or axle bearings. And, if they find a problem, they'll help you choose the smartest way to repair that problem, and get you back on the road... fast!